A foot print found in Crete is probably that of an early hominid and was made 5.7 million years ago. The single Out-of-Africa theory sometime around 70,000 years ago is already obsolete. 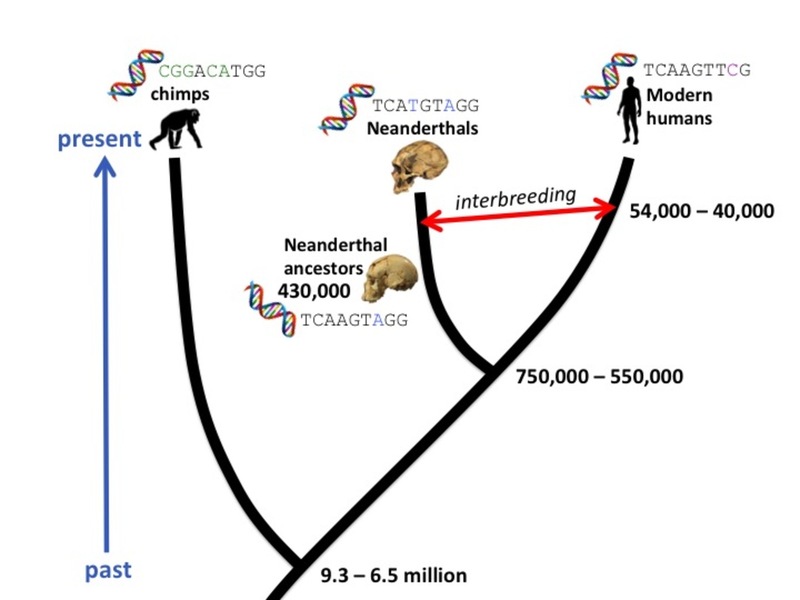 It was more likely to have been multiple hominin crossings out of Africa into both Europe and Asia. The expansion of homo sapiens sapiens is more likely to have been in at least two waves out of Africarabia. Homo erectus appeared around 2 million years ago while homo sapiens appeared about 1 million years ago. Homo sapiens sapiens then split from homo sapiens neanderthalensis around 600,000 years ago. So the footprint found is that of a human ancestor after the split with chimpanzees (c. 8-9 million years ago), after the beginning of bipedalism but well before homo erectus appeared. ….. Ever since the discovery of fossils of Australopithecus in South and East Africa during the middle years of the 20th century, the origin of the human lineage has been thought to lie in Africa. More recent fossil discoveries in the same region, including the iconic 3.7 million year old Laetoli footprints from Tanzania which show human-like feet and upright locomotion, have cemented the idea that hominins (early members of the human lineage) not only originated in Africa but remained isolated there for several million years before dispersing to Europe and Asia. The discovery of approximately 5.7 million year old human-like footprints from Crete, published online this week by an international team of researchers, overthrows this simple picture and suggests a more complex reality. ……. The new footprints, from Trachilos in western Crete, have an unmistakably human-like form. This is especially true of the toes. The big toe is similar to our own in shape, size and position; it is also associated with a distinct ‘ball’ on the sole, which is never present in apes. The sole of the foot is proportionately shorter than in the Laetoli prints, but it has the same general form. In short, the shape of the Trachilos prints indicates unambiguously that they belong to an early hominin, somewhat more primitive than the Laetoli trackmaker. They were made on a sandy seashore, possibly a small river delta, whereas the Laetoli tracks were made in volcanic ash. ……. …… During the time when the Trachilos footprints were made, a period known as the late Miocene, the Sahara Desert did not exist; savannah-like environments extended from North Africa up around the eastern Mediterranean. Furthermore, Crete had not yet detached from the Greek mainland. It is thus not difficult to see how early hominins could have ranged across south-east Europe and well as Africa, and left their footprints on a Mediterranean shore that would one day form part of the island of Crete. ‘This discovery challenges the established narrative of early human evolution head-on and is likely to generate a lot of debate. Whether the human origins research community will accept fossil footprints as conclusive evidence of the presence of hominins in the Miocene of Crete remains to be seen,’ says Per Ahlberg. We describe late Miocene tetrapod footprints (tracks) from the Trachilos locality in western Crete (Greece), which show hominin-like characteristics. They occur in an emergent horizon within an otherwise marginal marine succession of Messinian age (latest Miocene), dated to approximately 5.7 Ma (million years), just prior to the Messinian Salinity Crisis. The tracks indicate that the trackmaker lacked claws, and was bipedal, plantigrade, pentadactyl and strongly entaxonic. The impression of the large and non-divergent first digit (hallux) has a narrow neck and bulbous asymmetrical distal pad. The lateral digit impressions become progressively smaller so that the digital region as a whole is strongly asymmetrical. A large, rounded ball impression is associated with the hallux. Morphometric analysis shows the footprints to have outlines that are distinct from modern non-hominin primates and resemble those of hominins. The interpretation of these footprints is potentially controversial. The print morphology suggests that the trackmaker was a basal member of the clade Hominini, but as Crete is some distance outside the known geographical range of pre-Pleistocene hominins we must also entertain the possibility that they represent a hitherto unknown late Miocene primate that convergently evolved human-like foot anatomy. The Aquatic Ape Theory is one that the mainstream loves to lampoon and ridicule (here and here for example). For the first time in some 50 years a conference on the subject is being currently held in London — much to the disgust of main-stream evolutionists. But for all the ridicule, the fact remains that we do not yet have a satisfactory explanation for how modern humans came to shed their fur, developed bi-pedalism and developed a layer of fat under our skins. The “consensus” theory that climate change caused forests to change to savannahs and forced primates to leave the trees, walk on two legs to use their hands, start running to catch prey, discard their fur to stay cool and develop sweat glands to get rid of the heat generated, actually has almost as many holes as the Aquatic Theory. Maybe some integration of these theories is necessary. Or perhaps there is a better theory waiting to be found. In any event, I have a natural suspicion of all science which has to invoke a “consensus” to justify itself. But more importantly I just like the idea of some idyllic, aquatic interlude in our ancient past. The New Scientist has been one of the high priests of the AGW doctrine and “global warming” has been a dirty word. It represents politically correct “establishment science” and generally shuns the scepticism and irreverence of the true scientist. It has been – and still is – extremely reluctant to admit to any weaknesses in AGW dogma or in any possible benefits of global warming. But as “global warming” has morphed to the less emotive “climate change” and it is becoming clearer that man-made emissions don’t even control global CO2 levels – let alone the climate – the “settled science” is being shown to be anything but settled. There are some slight signs that the New Scientist is positioning itself so that it can be found to be on the side of the good guys no matter what surprises the climate may have in store. Change and variability in Plio-Pleistocene climates: Modelling the hominin response by Matt Grove is a new paper in the Journal of Archaeological Science. The research expands a technique originally developed by theoretical biologists. The technique distinguishes between climatic change and climatic variability. Change results in directional selection; variability selects for plasticity. Results suggest selection for plasticity increases c.2.3-2.5 mya. This date range coincides with the evolution of Homo and the spread of the Oldowan. To work out whether climate had a hand in the speciation spurt, Matt Grove of the University of Liverpool in the UK turned to a global temperature data set compiled by Lorraine Lisiecki at the University of California, Santa Barbara. Lisiecki analysed oxygen isotopes in the shells of fossilised marine organisms called foraminifera. During glacial periods, the forams’ shells contain more of the heavier of two oxygen isotopes, as the lighter one is preferentially accumulated in snow and ice rather than the ocean. Grove found that the mean temperature changed suddenly on three occasions during the last 5 million years. Each change was equivalent to the difference between glacial and interglacial temperatures – but none of these episodes coincided with the hominin “golden age”. What marked out this period was a greater range of recorded temperatures, suggesting it was a time of rapid but short-lived fluctuations in climate. Grove says such conditions would have favoured the evolution of adaptability that is a hallmark of the genus Homo (Journal of Archaeological Science, DOI: 10.1016/j.jas.2011.07.002). Grove says the classic survival traits of H. erectus, forged during this period of change, include teeth suited for generalised diets and a large brain – both of which should have been advantageous at a time of swift climate change.